Pref 'toolkit.telemetry.enabled = true' is marked as locked. I want to disable this pref but haven't found a way to do it. Does anyone know how to unlock it so I can disable it? streetwolf wrote: I want to disable telemetry but haven't found a way to do it. You use a development build [Firefox/59] which purpose is to provide feedback. 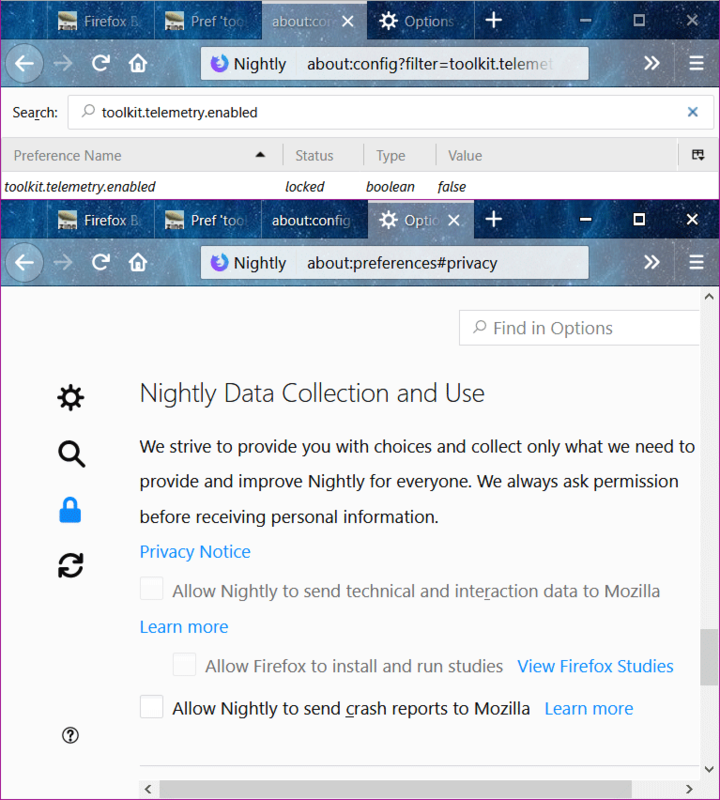 If you don''t want to contribute to development, you can try Firefox 57 which is a official release. You are making an assumption without all the facts. I've been having an issue that when I exit out of Fx and then start Fx again it takes about 6 seconds to get into Fx. I ran Process Monitor and it appears it might have been sending data to presumably Mozilla. I wanted to disable the pref just to see if it was the cause. I have been testing Inbounds and Nightly's for years so don't give me a lecture. All you needed to ask was why I wanted to unlock the pref. Did you turning off toolkit.telemetry.shutdownPingSender.enabled as I suggested earlier ? No difference in your issue ? Diorser wrote: You are making an assumption without all the facts. I've been having an issue that when I exit out of Fx and then start Fx again it takes about 6 seconds to get into Fx. I ran Process Monitor and it appears it might have been sending data to presumably Mozilla. I wanted to disable the pref just to see if it was the cause. streetwolf wrote: All you needed to ask was why I wanted to unlock the pref. This does not work in dev edition 59. Is it still supposed to or did they deliberately disable this capability? According to Mozilla it is enough to set datareporting.healthreport.uploadEnabled to false to completely disable telemetry. On Firefox Desktop starting with 58 toolkit.telemetry.enabled is locked to "true" on beta, aurora, and nightly channels (as well as unofficial builds with the 'default' channel). It is locked to "false" in all other cases. This, rather unstraighforwardly, does not mean Telemetry is enabled. This means that, if telemetry is enabled, we collect somewhat more information. More details about our unfortunately-confusing Telemetry preferences can be found in the docs and in the bug tree rooted at bug 1406390. We plan on straightening out the confusion caused by these historical naming artefacts next year (->2018). Telemetry is always enabled and recording base data. Telemetry will send additional main pings. We're so lucky to be able to choose our telemetry flavor, I bet Chrome just has a single monolithic telemetry. If unified is true, this controls whether we send Telemetry data. If unified is false, we don’t use this value. And if unified is false? This is the data submission master kill switch. If disabled, no policy is shown or upload takes place, ever. Look, another master switch, naturally, because the previous master switch is sometimes ignored. It's really not hard to have a single pref that completely disables telemetry (both collection and transmission) and never changes (in name or meaning). There is no good excuse for this mess.